Thursday Doors, Streetside in Hue, Vietnam, 11/5/17. It’s been a while since I’ve put words into WordPress. Travel and a tragedy removed my focus from the weekly challenges and my fingers haven’t felt like hitting the keyboard. Price and goods in anticipation of my purchase…. Streetside, Hue, Vietnam, November 2016. 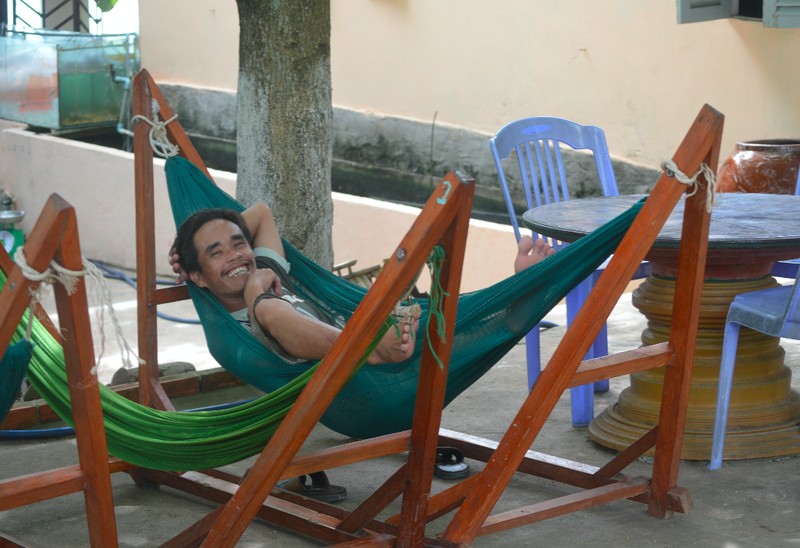 This week some more from the beautiful town of Hoi An in Central Vietnam. An eclectic mixture of windows and shutters from houses, temples, and shops resulting from my poking around all corners of this fascinating place. This month’s challenge from Jude is “During November I want to see trees or leaves or anything found in a woodland environment”. When you have a dodgy hip and you don’t want to stop seeing Hue, the answer is to hire a Cyclo driver. After a morning at the Imperial palace, which is huge, impressive and awesome, my legs told me I couldn’t do much more, but there was so much more of the city to see. I didn’t post for Thursday Doors last week as I was en route to Vietnam. I’ve now reached Huế in Central Vietnam. There are times when you just decide to do something with great enthusiasm and then, as it gets closer, you hope it’s not out of your comfort zone. A to Z challenge: M is for Melo…. 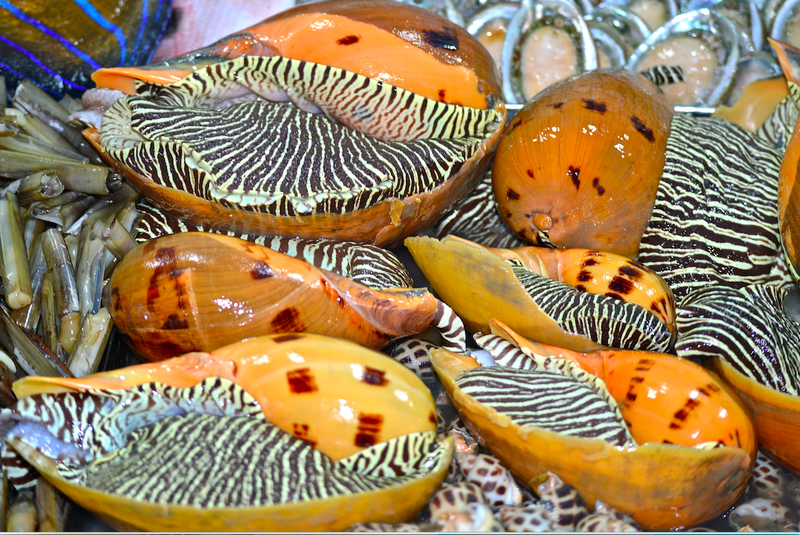 Melo melo, common name the Indian volute or bailer shell, is a very large sea snail, a marine gastropod mollusc in the family Volutidae, the volutes. 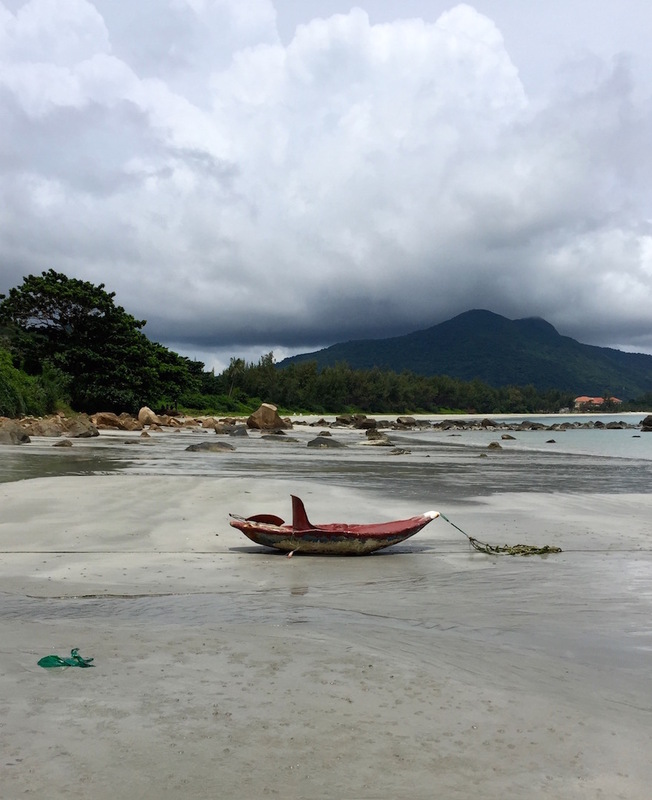 Vietnam re-visited October 2015: Con Dao Archipelago. 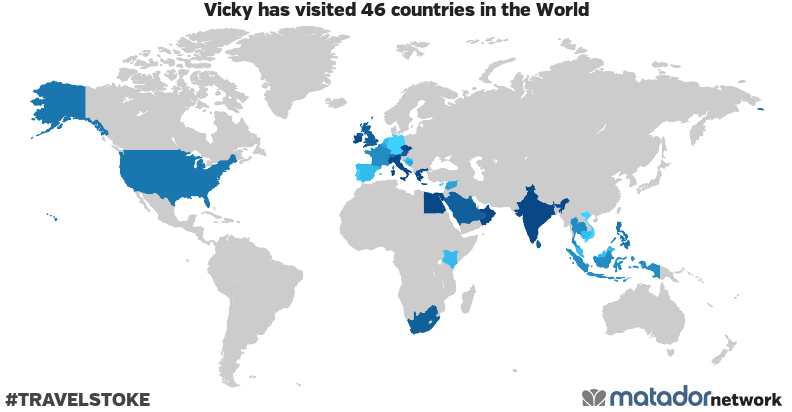 Having visited Vietnam in 2013, I was keen to go back and an Eid holiday early October 2015 seemed the perfect time. Originally the idea was to base travel around the Hoi An area and discover the coastline and sights, but reading weather reports, it didn’t seem like a wonderful time to be travelling around on a motor-bike as it’s the rainy season during October and its pretty dismal being wet on a bike, so a re-think was required. 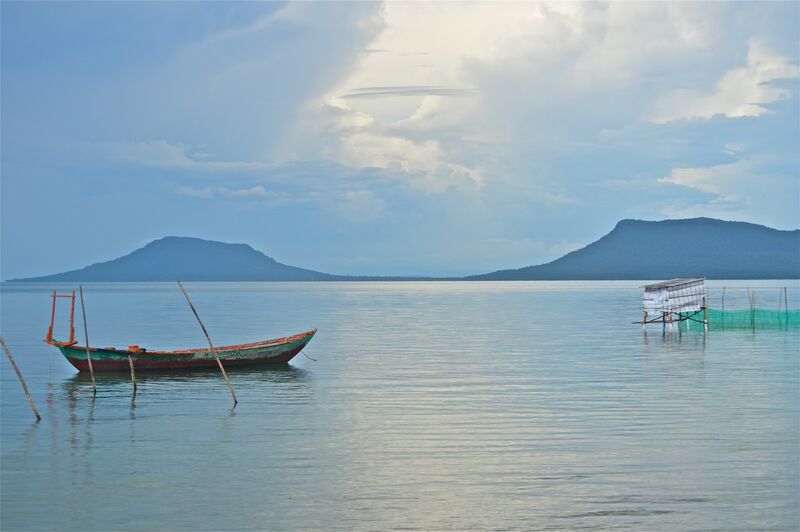 Con Dao archipelago and a re-visit to Phu Quoc island was the new itinary and duly booked. 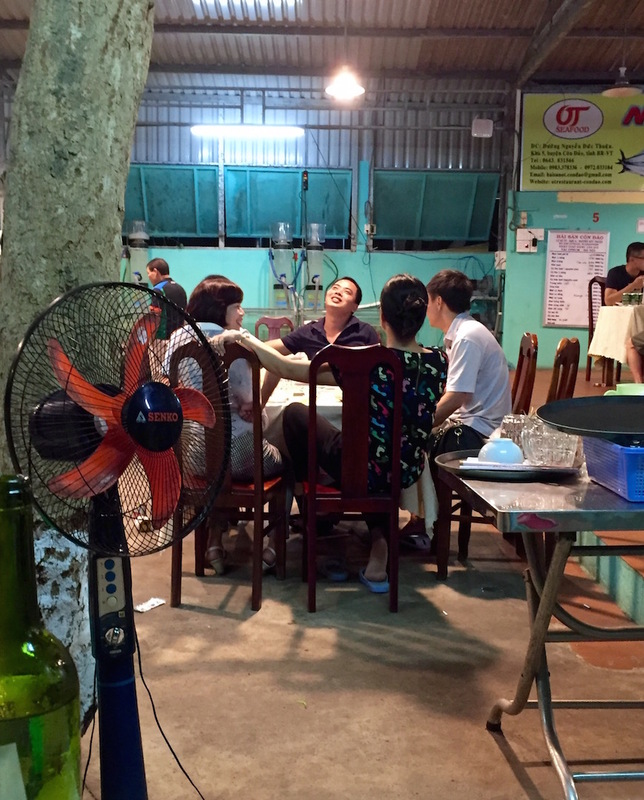 An overnight stop at a hotel in Ho Chi Minh for flight connections was conveniently close to be within walking distance from the airport. Con Son Island, the only inhabited island in the Con Dao archipelago, is a 45 minute flight from Ho Chi Minh. 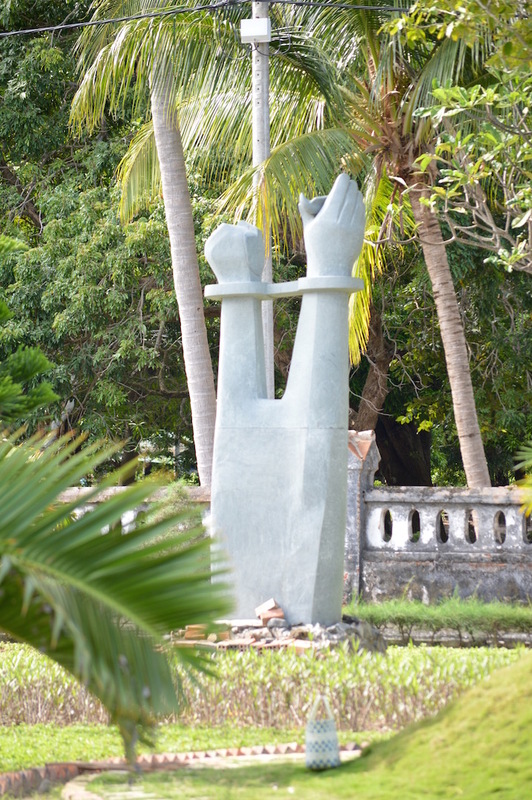 Not a huge choice of hotels on the island, ranging from the uber-stylish Six Senses, to various small hotels. 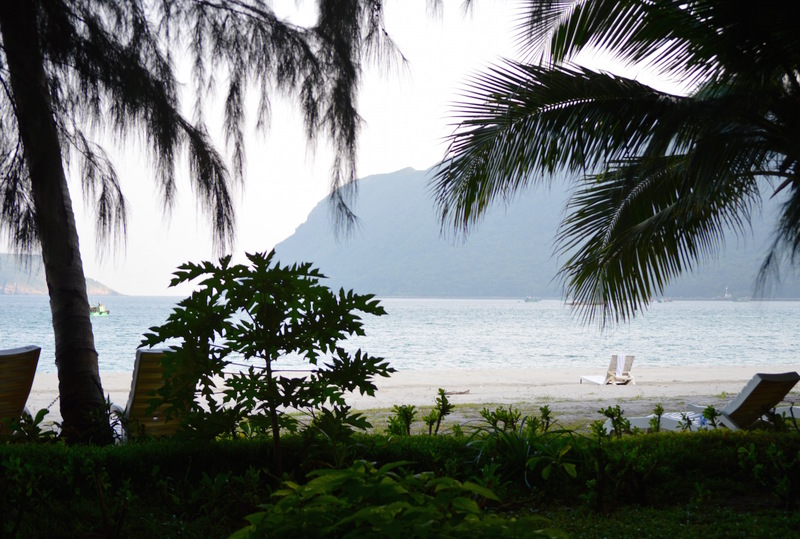 Con Dao camping was my choice (I wasn’t feeling uber enough financially for the luxury SixS’s). 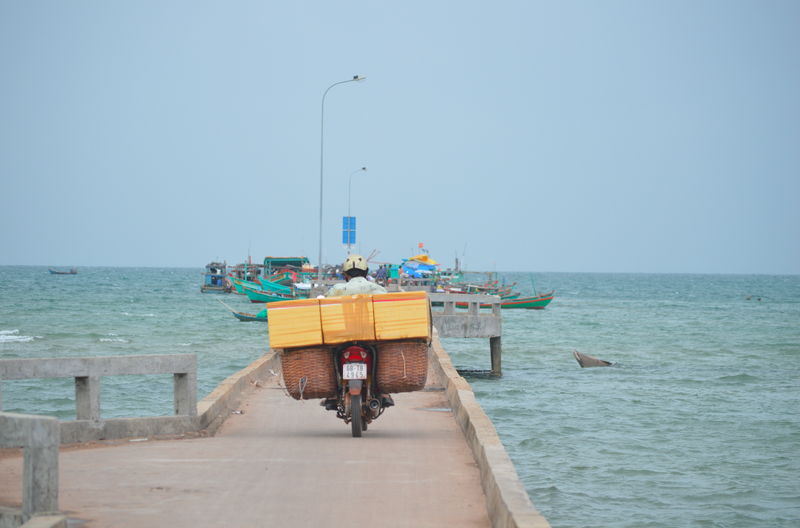 A short taxi ride on the island road to town was an introduction to the idyllic scenery of the archipelago. The road has been carved around the steep mountains for access to Con Son, the town and the fishing port at the far end of the island. The island has only 30km of tarmac road and few tracks, the mountain terrain is completely inhospitable and the army have the only access to the other side of the island. Con Son was home to the infamous penal system for Vietnamese nationalists imprisoned under the French colonial era and subsequently the Americans kept the prisons running during the Vietnam War. Many Vietnamese make the visit to the island to pray and leave offerings at the shrine, we were told the majority of these visitors are from Hanoi area. My plane was full of families with huge flower arrangements, at first I thought it may be a public holiday, but after arriving, I understood it was the normal tribute for respect of those who were lost in this lonely place, where families come to pray for those who were lost over a period of many years .. It is hard to understand the attrition of war, earlier and later, conditions here must have been dire, when it was only a penal colony under French rule and then the Americans took it over. I hate to think of the abuses, it was, at that time, a war we had little understanding of . 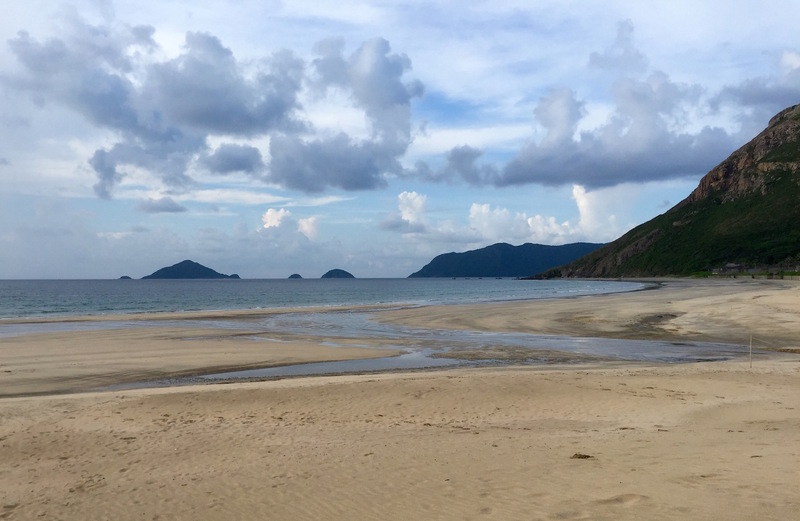 There are 16 islands in the archipelago and are now part of the Con Dao National park. 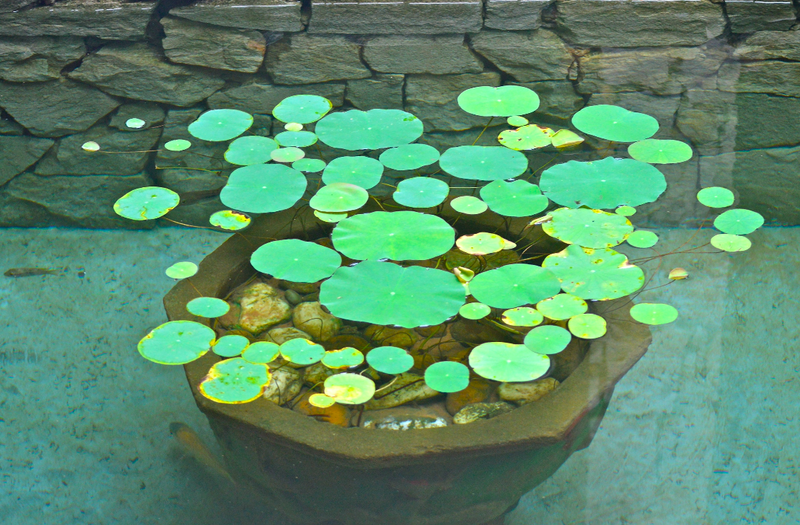 Turtles species and dugong are amongst the endangered species protected within the park. The scenery is spectacular, Con Son has a huge sweep of bay protected by outer islands, and there are some popular swimming spots off the promenade. 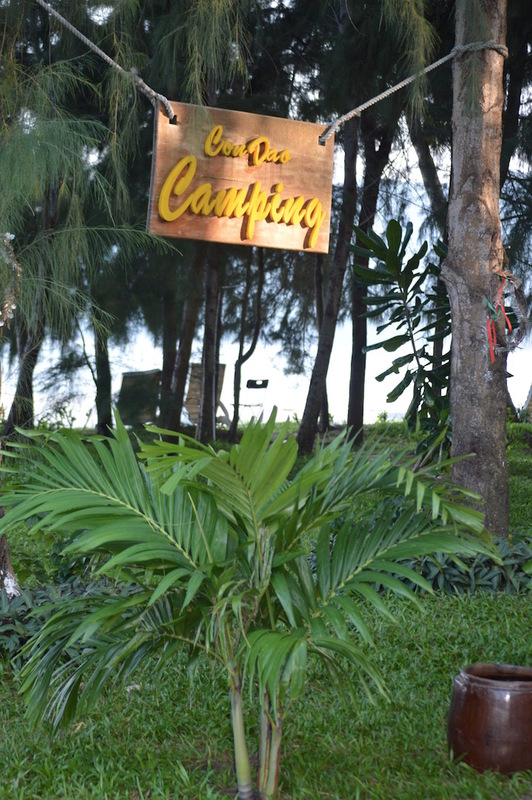 Con Dao Camping was the choice of resort and I wasn’t disappointed. Basic A-frame rooms opening onto the beach with a glorious view,it was all that was needed. Off out early on the first morning, a walk down the long beach was a must and I wasn’t disappointed. The best way was to travel was on a small motorbike, so we headed off to the fishing port at the end of the road, opposite hon Ba Island. The fishing port was languorous in the heat of the day, activity seemed to be at a slow pace, but as always, there were portside shops and drying fish spread out alongside the dock. Further down the road was a huge area of dredged sand, so it was time to check out the shoreline. 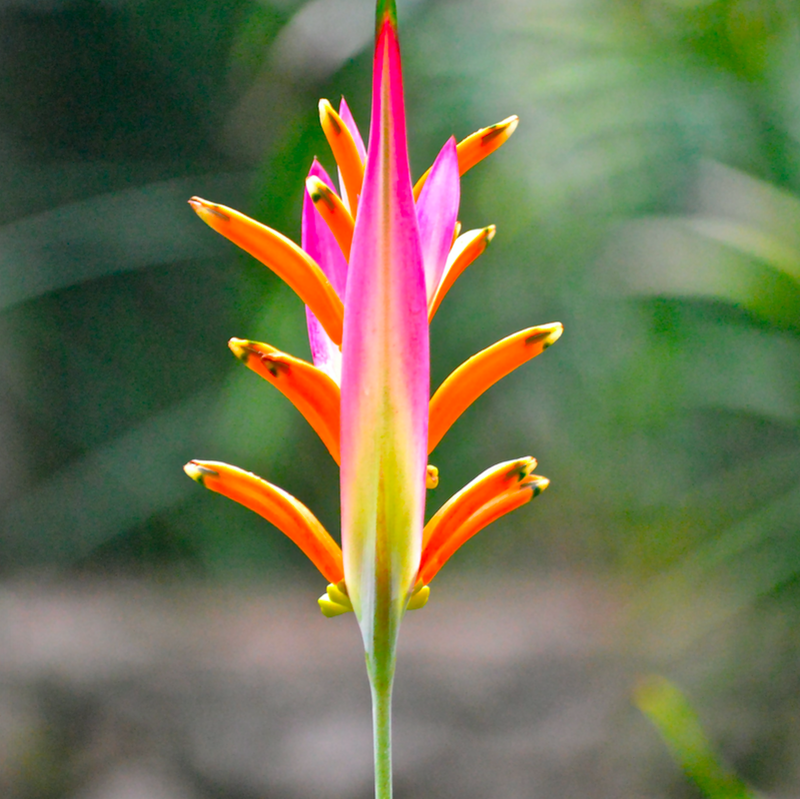 The area was full of Vexillum of different varieties and also the dreaded sand fly. On arrival at the camping resort we were warned about sandflies all over the island,and duly stocked up with the Deet on sale, slathered it on, but my hunting had taken me into the sea, so my ankles were now Deet-less …and I paid for it! Looking down and wondering why my ankles seemed to be flecked with black dots, I realized and started to beat them off .. too late,the damage was done and continued, unbeknown to me … I’ve always been fairly immune to bites, so wasn’t too worried about it and casually we headed back to town with a good collection of beach finds. 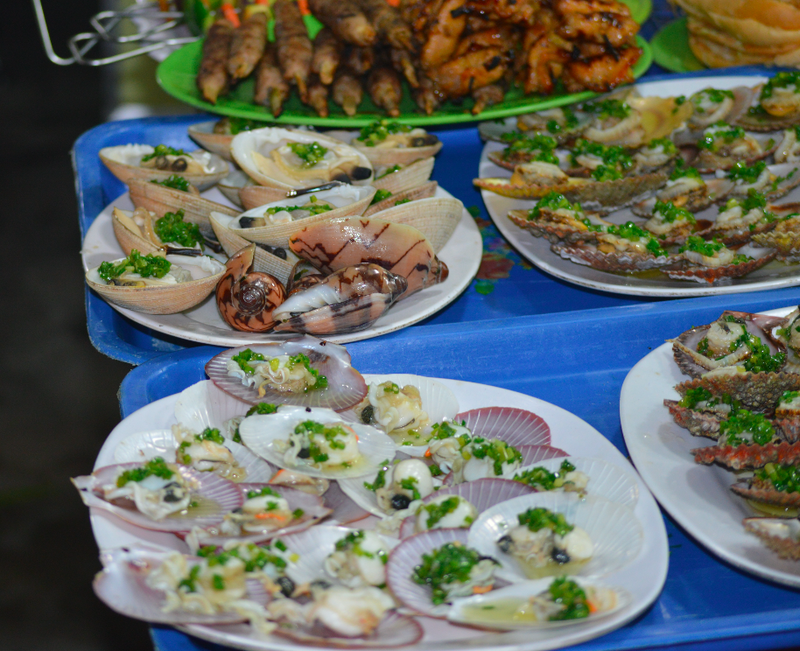 In Vietnam, the food is a huge draw, there aren’t too many places to eat in Con Son, but a row of restaurants behind the camping resort led us to choose Ot seafood restaurant. 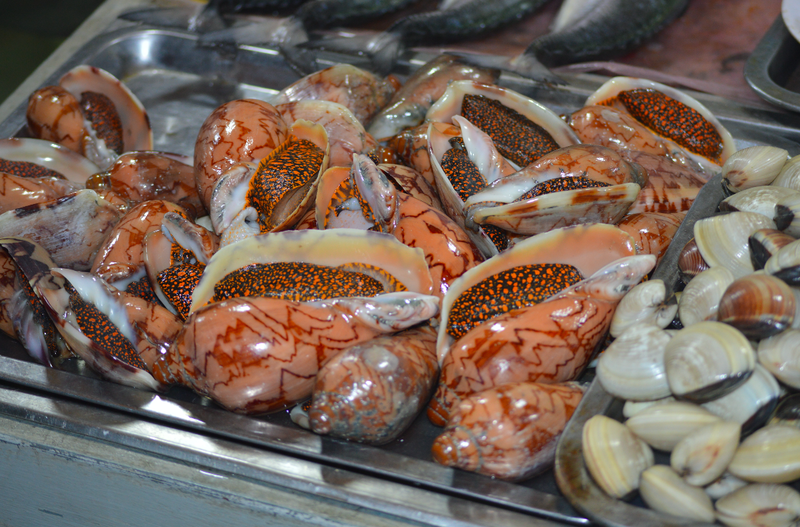 Choosing from the large tanks of fish and shellfish, everything ordered was delicious and fresh! Basic décor, friendly staff, little English spoken, but adept at understanding my hand-signals,it made it the place to eat for the stay. Mosquito coils lit, sprayed with every repellent I had brought, it was time to sleep…which didn’t happen, the sandfly bites, innocuous at first, suddenly turned into an itch, which got worse and worse. Once scratched, it’s a vicious cycle and finally I slept for a short while, with ankles wrapped in wet flannels. As dawn broke I was back out on the beach (covered in Deet) to be greeted by local ladies taking their exercise before the heat and humidity of the day started.A loudspeaker was broadcasting over the town, a female voice, strident and clipped…was it an impending disaster being announced by civil defence ? Had I been spotted hoarding sand dollars? Was a tsunami approaching? .. very disconcerting,what was going on? but watching the local ladies continue undisturbed, striding down the beach, I could only assume all was well . 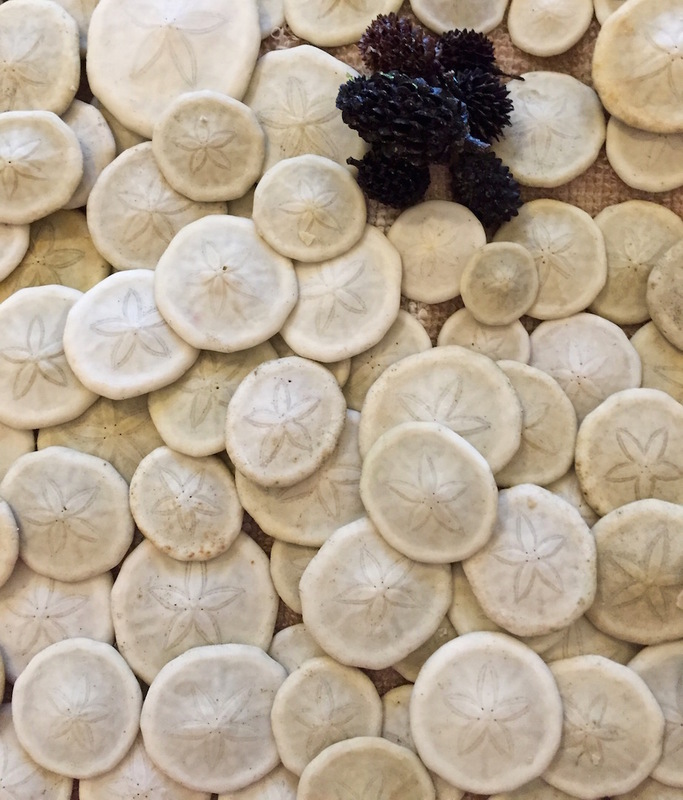 Unable to resist the lure of even more sand dollars , I did my morning workout by bending and collecting and watching the tranquil sunrise appear over the South China Sea , a glorious spectacle. Within 5 minutes dark clouds appeared over the mountains behind me, thunder and lightening and the heavens opened. Time to retreat…Finding refuge in the beach restaurant of the resort and requesting a coffee from the only person around, later discovered to be the resort maintenance man, I was served an interesting Vietnamese coffee .. thick grounds filtered down into an inch of ice cold water .. okay, well, when in Vietnam … it certainly woke me up ! Querying the exhorting broadcast later with the resort manager, she sheepishly explained that the daily early morning broadcast was the news. TV, Radio and Internet access is not common over the island, so each day a 6am government broadcast gave the locals a morning update on the news. Con Son beaches are few, but visiting them all was a priority, so off we hurtled on the trusty bike. 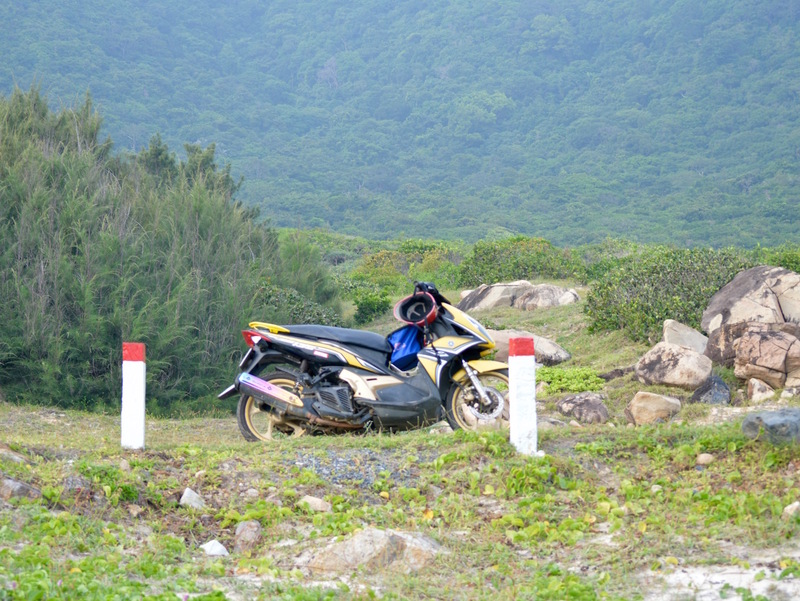 By the airport is a muddy track to one large beach, getting there was an achievement in staying on the bike. Plenty of potholes and remembering the dire warning I read somewhere, that in case injuries cannot be treated on Con Son, with its limited facilities, an airlift by helicopter is needed, which comes with a $5,000 advance payment, I will say here that much care was taken. A beautiful beach, with food shacks and hammocks awaited us and as always, a long walk ahead beachcombing. Quite limited on the shell collecting side, I trawled through the tideline and came up with some wonderful Sea beans and tree fruit cast up on the shore … this part of my collection started in Borneo and Vietnam yielded a wonderful selection for the Bean jar. 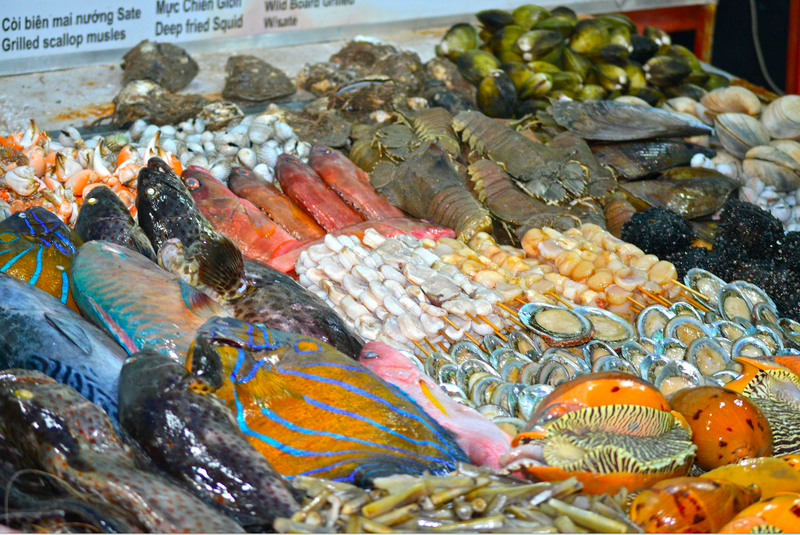 Sea Beans, fruits and Tonna…. 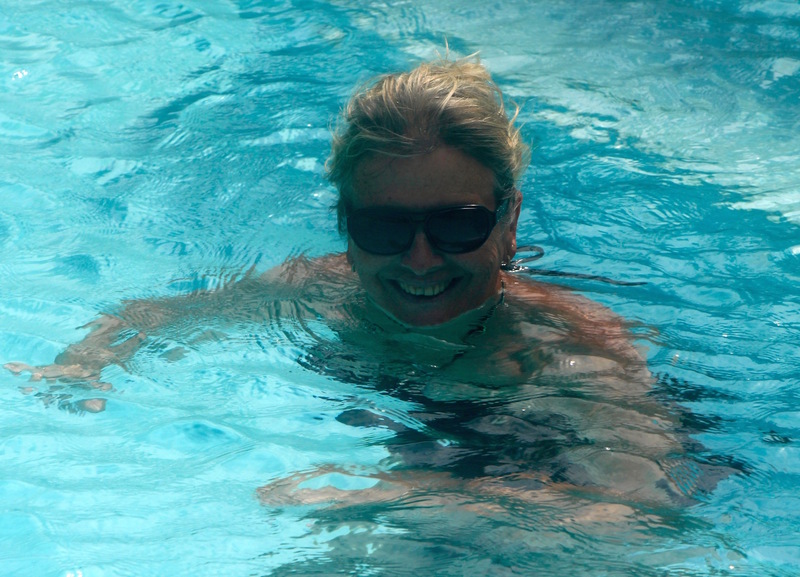 It was hot and humid, so a plunge into the sea for a float, just taking in the beauty of it all was a welcome rest…. Time for a beer, maybe some food too, if we could understand what was on offer to make a choice. Heading up to the closest food shack, there were tanks of live seafood, some interesting choices but it was too hot to eat, so a fresh coconut quenched the thirst and it was then onwards to the next stop. 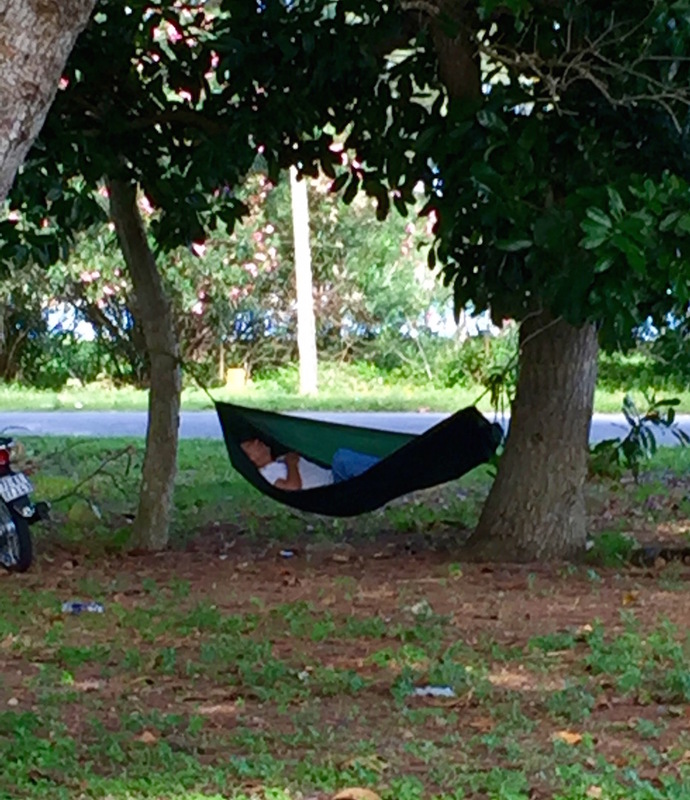 Vietnam is the land of the hammock, everywhere you go, there are hammocks, there are stands in some areas for “take your own hammock” use, it isn’t unusual to see a motorbike stop by two trees, hammock unrolled and attached and instant sleep by the occupant, understandable in this humid climate. On the opposite side of the peninsula there was no defined road to the beach so another scary bike-slither down a muddy road onto the most beautiful white sand beach. The Airport runway edges out into the sea, but the resourceful locals bike it at low tide to the opposite end. Several bikes came past with bags of shells and fish, heading to the market for sale, no-one else around on this white sand paradise. 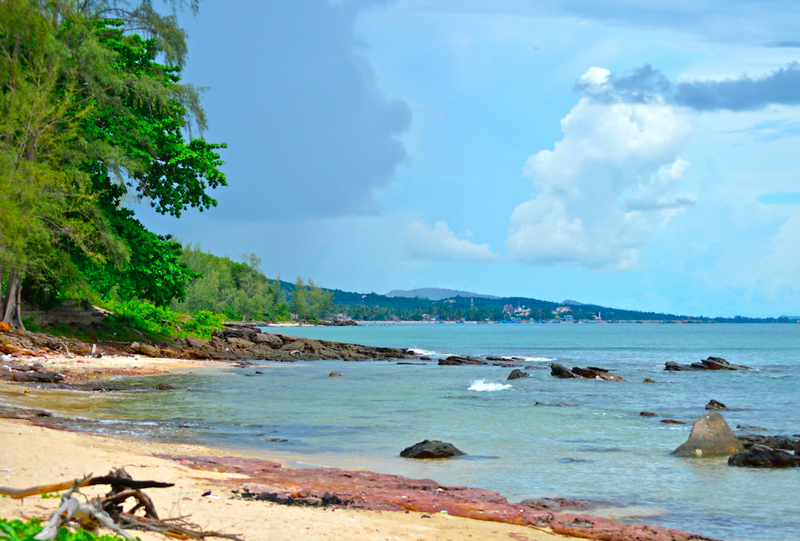 Time to leave this little island and head across to re-visit Phu Quoc. An early morning flight, taxi organized for the short airport journey, off we headed. First sign of change was our Vietnamese taxi driver stopping talking on his mobile, and trying to explain something. Language barrier matched the airport barrier, hmm, obviously airport was closed, assuming a flight delay, we asked him to take us to the fabulous Six Senses resort , the closest stop, surely they would welcome us for breakfast, we didn’t look too scruffy……..
Offloaded at the entrance, the welcome was superb, escorted to the beachside dining room, a personalised tour of the breakfast fare on offer, wonderful. Homemade smoothies, Turkish poached eggs and a selection from the cold room, this was turning the day from bad to luxurious. Free wifi meant a check up on the flights and new connections with the advantage of guest watching, some falling into the “ very interesting” category, the spectacular sweep of the Six Senses bay, highlighted by the rising sun, all in all, the best decision made. Dragon fruit, Passion fruit, Jackfruit, Salami, Egg ,Ham and Cheese ..all from the Six Senses breakfast cool room .. yummy ..
Our taxi driver returned, perfectly on time and off to Ho Chi Minh we went. Vietnam airlines (operated by Vietjet) my choice. Be aware that flights can be cancelled with little warning. 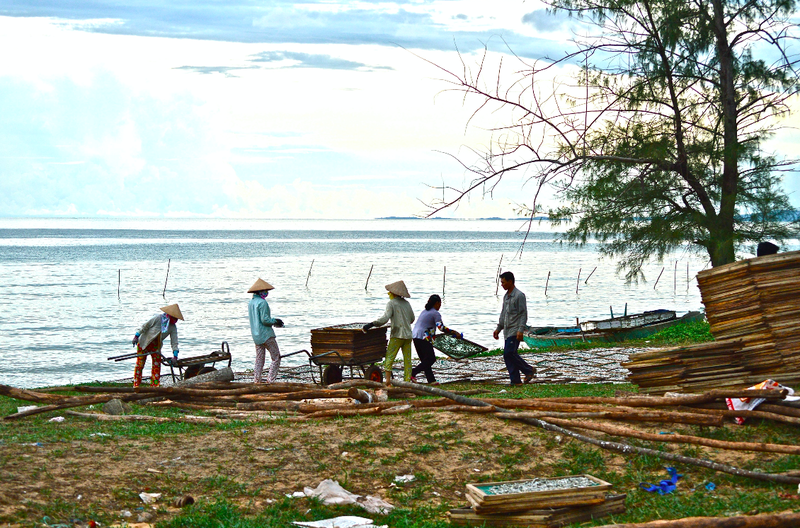 A short plane ride from Ho Chi Minh, Phu Quoc island is on the cusp of development investment, but for the present, retains its authenticity as one of Vietnam’s traditional fishing locations. Baffling road works around the airport show the amount of investment that is slowly starting to create the infrastructure for the development of tourism. 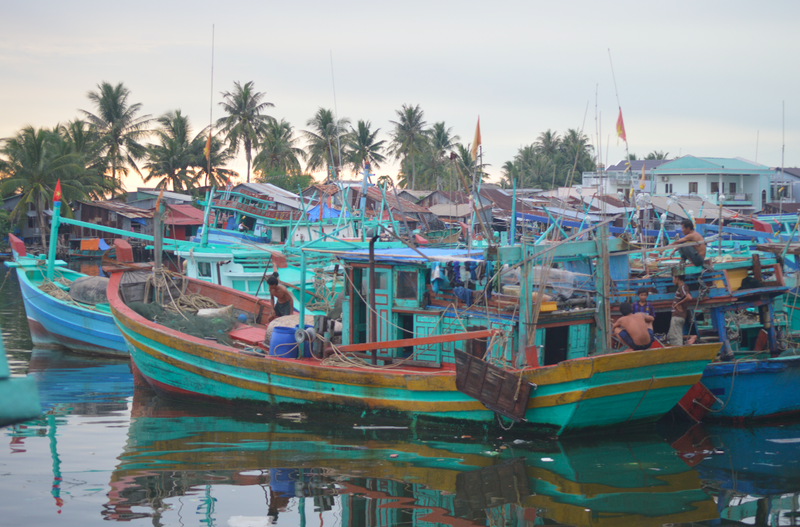 In years to come it will be a jewel in the Gulf of Thailand , but for now it’s a sleepy island, abject poverty in some areas and incredibly beautiful in others. 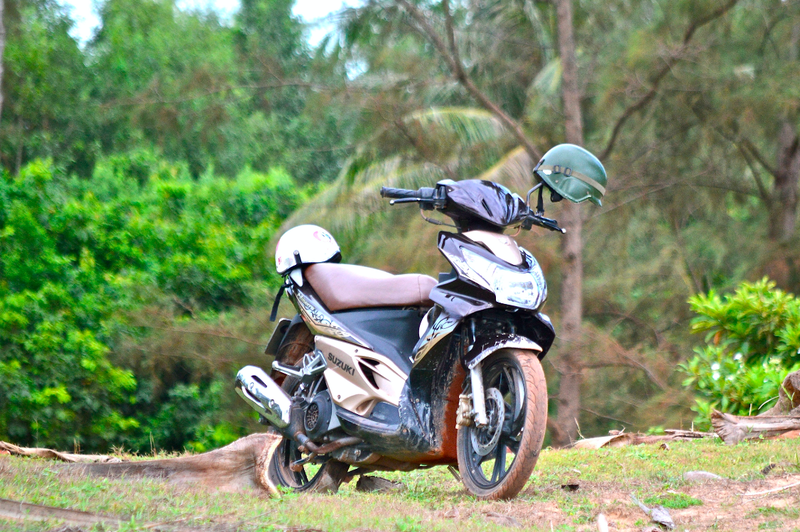 Hiring a motor-bike seemed the way to explore and when presented with motorbike helmets in camouflage design and a wry grin on the face of the renter , the feeling of being a Great White Westerner was compounded. 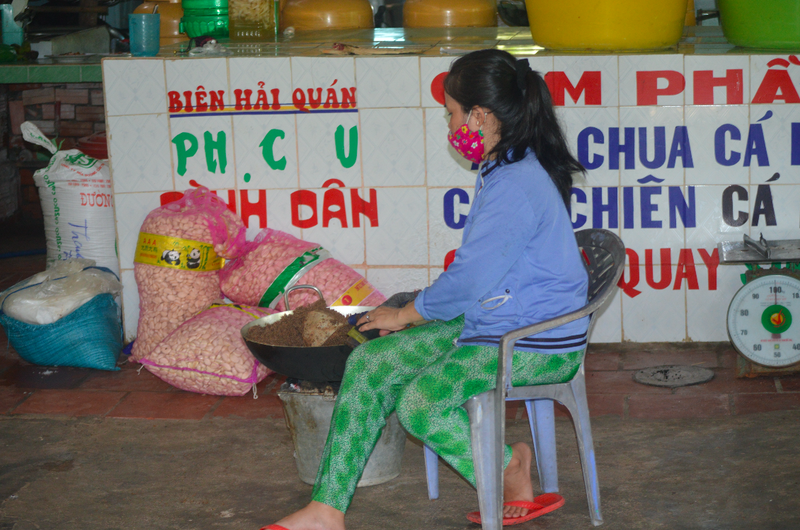 Seriously though, the Vietnamese people are tiny in stature and size, and even more so away from Ho Chi Minh city and fast food outlets , the islanders are fit, lithe and the obesity of our western world seems positively self indulgent. 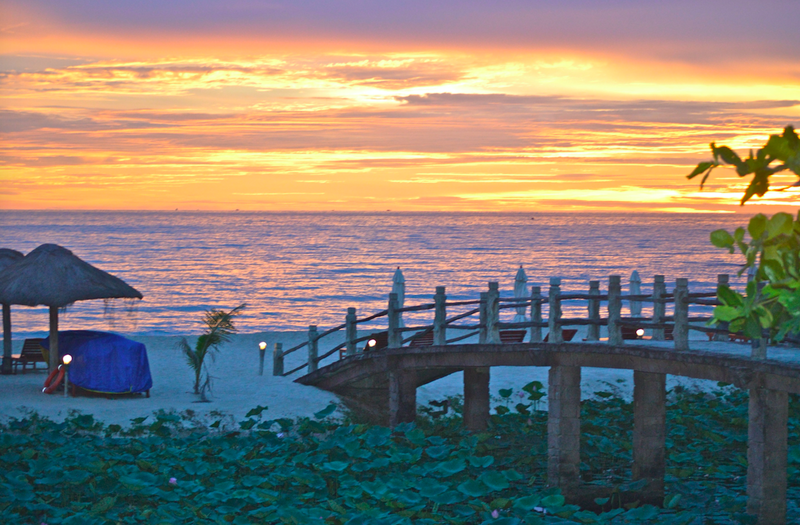 Duong Dong is the main town on Phu Quoc and hotels lie between the airport and town as the road hits the coast. As yet, the star ratio may not be equivalent to other countries, but being welcomed with hot towels, lemongrass drinks and lovely smiling faces puts inadequacies to rest. Off to the night market, my first experience of the famous Asian markets which seem to be a whole different set of social and daily necessities rolled into one.Phu Quoc’s night market is mainly restaurant-oriented with stalls and tables presenting the most amazing displays of fish wares to be cooked in the local style. Did I dare to eat these? 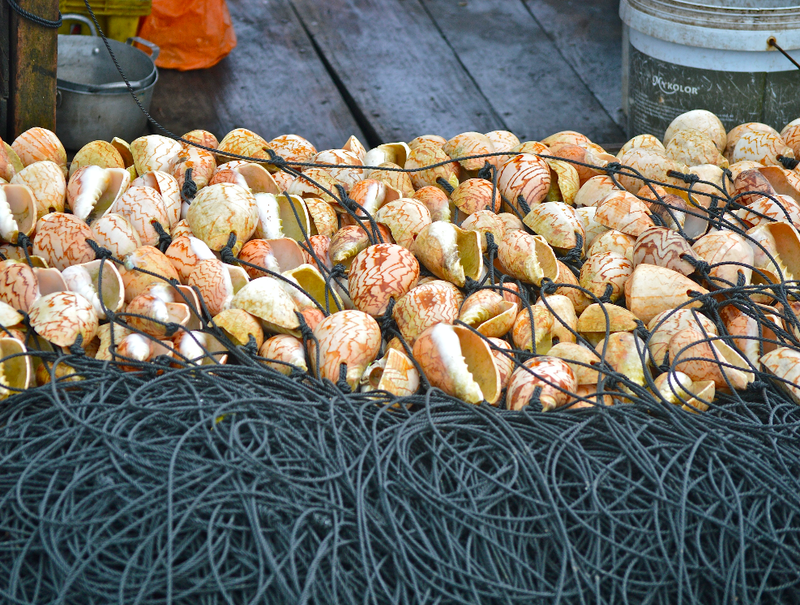 ….not this time, check out Borneo 2 years on ..
More shellfish …wonderful colours, and they taste good too…. 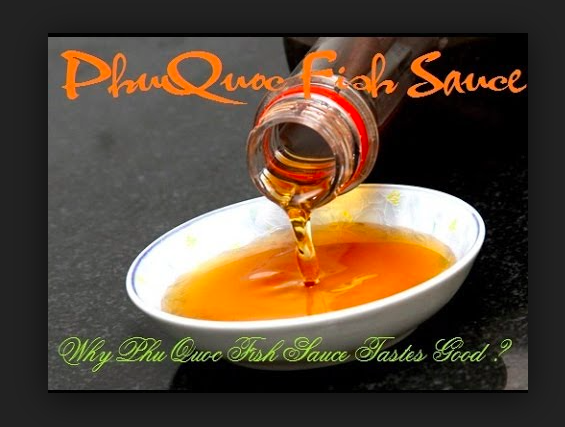 Famous for its fish sauce (so pungent that airlines ban it, in case the bottles should break …and yes I did get caught on departure and asked to hand over the one I had purchased ) the only way to eat is local style. The cooking is superb, order scallops and not 3 or 4 are presented as in the West, but a whole heaped bowl of scallops tossed in greens and spiced only the way Vietnamese know how. 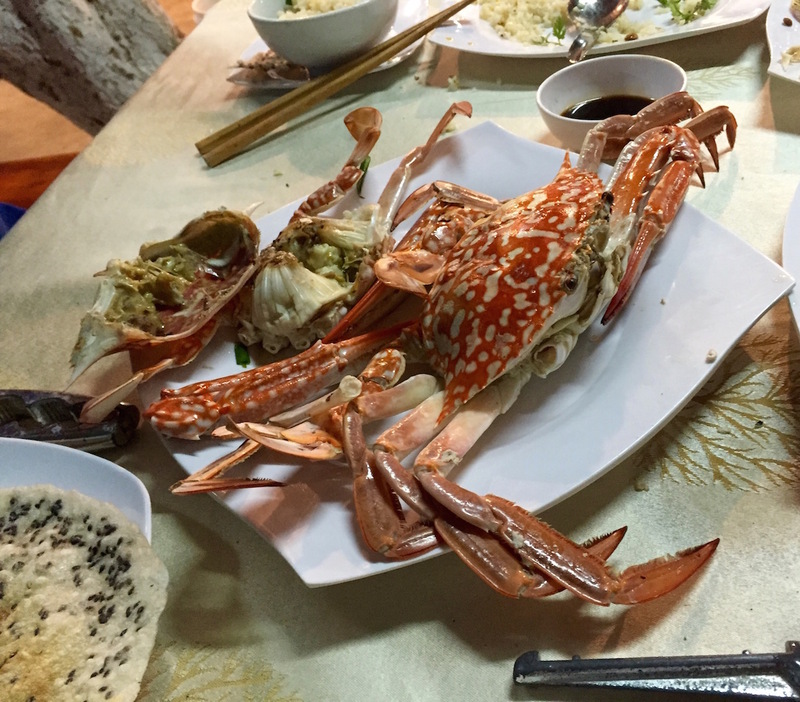 Utterly delicious and the lobster splurge “lets go for it” feast was to die for. 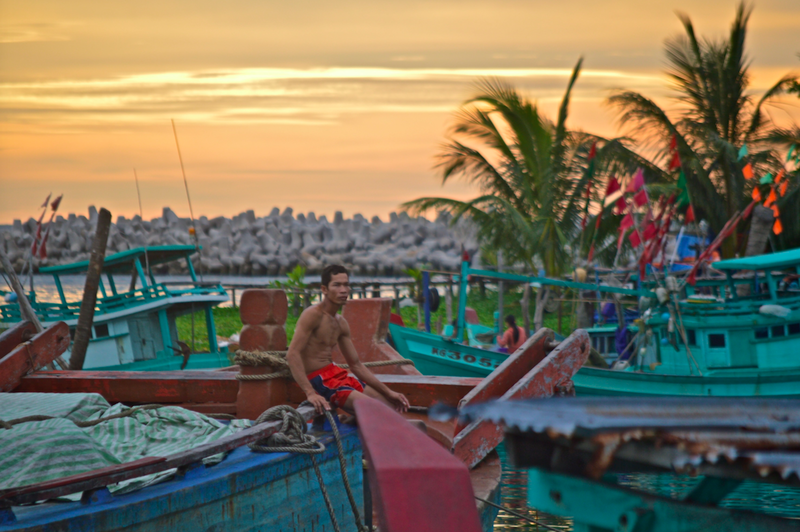 Fishing is the main staple of the economy on Phu Quoc, every village has its own boats, and the main fleet are based in Duong Dong… feeding the local market with fresh produce from the Gulf of Thailand. 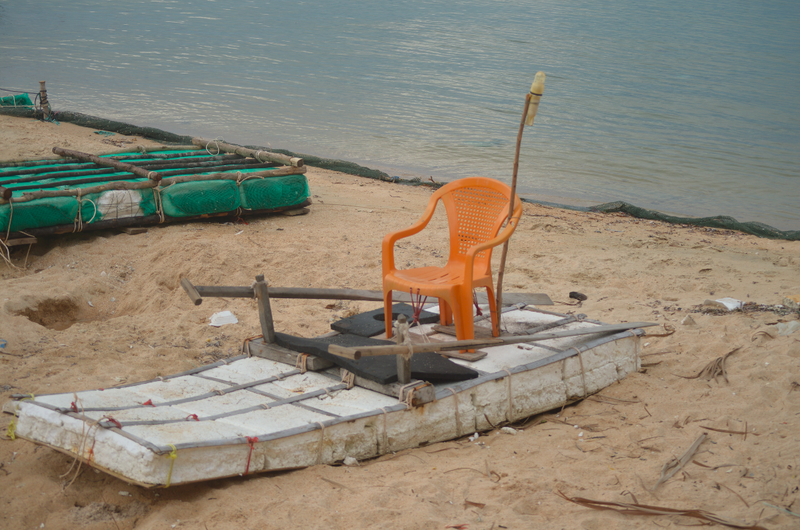 I would wonder quite how seaworthy this little craft is …. 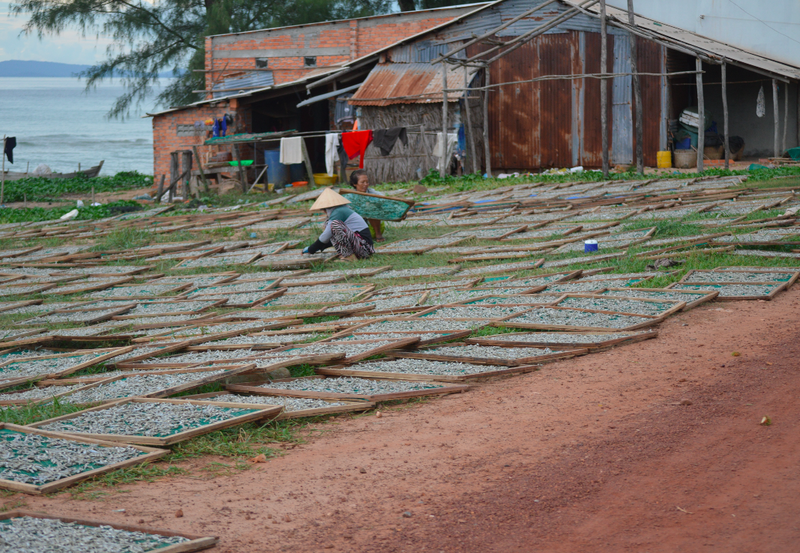 Drying fish for food and fish sauce is part of daily life and all around the island wooden trays were laid out to dry, with pungent fish drying in the sun. You knew you were heading towards one of these areas from quite a way away. 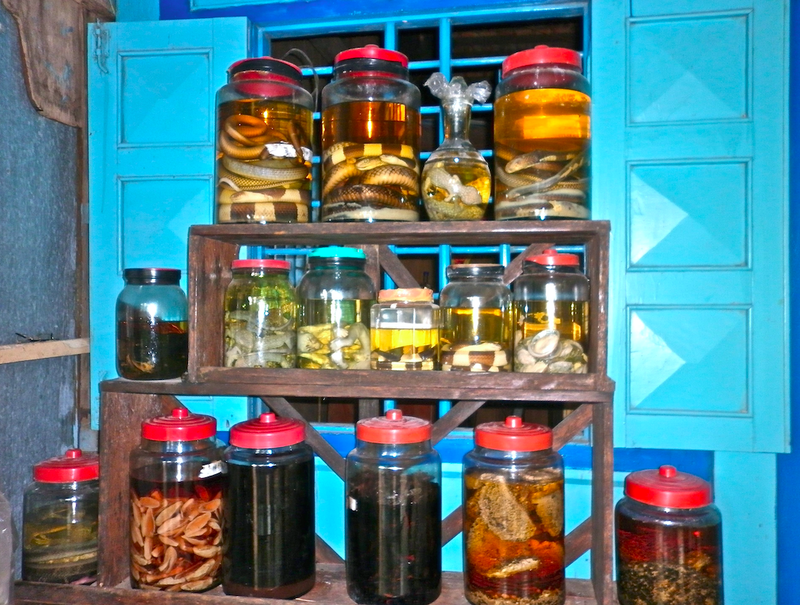 Overpowering aroma of drying fish became a part of travel …. Memories of Phu Quoc are arriving in a small fishing port on the landward side, finding an incredibly long pier built right out into the sea as the lagoon was so shallow, the boats couldn’t dock, walking out along the endless pier, being “friended” by some visiting mainland Vietnamese and somehow being centre-stage in their holiday snap shots without uttering a word, but lots of smiles. 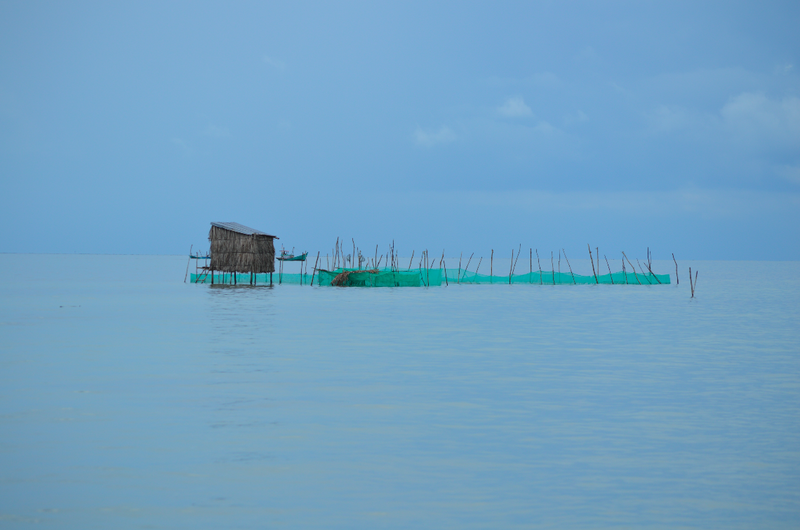 I was their new western friend for a shutter moment, seeing nets in the back of boats which were threaded with huge Volute shells to hold the net down in the water. 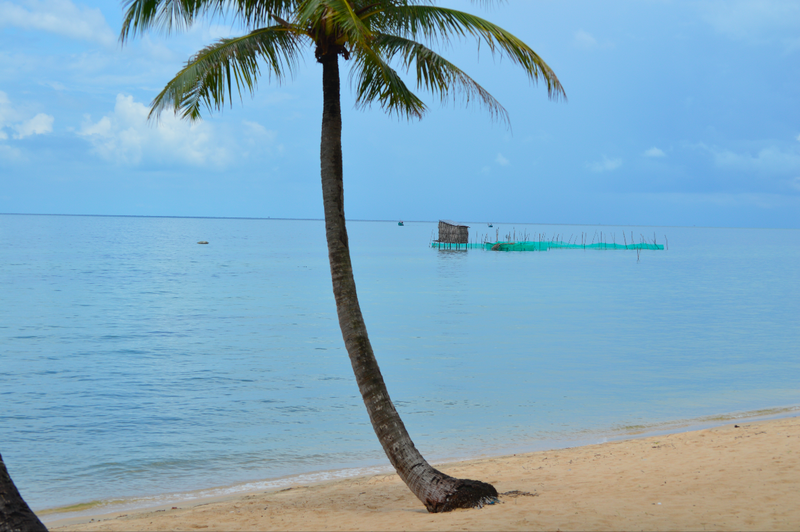 Further up the dirt track which rings the island and the route to the main port on the landward side, stopping at a small sign offering coffee and being shown to a bench looking out over a turquoise sea framed by coconut palms, watching the fishermen in their small rattan huts perched on stilts above the sea. One of the best locations ever for coffee! View from the coffee-shop, beats Starbucks any day …. Coming across an alligator farm and shop on the side of the road, going to look, the owner was too indifferent to our presence in the heat of the day to exit his hammock and try to make a sale, We left empty-handed as the languor was catching, it was too hot to buy. Meeting fellow travellers on a remote beach,the only Europeans we had seen and having an intense conversation about Asia and travels with complete strangers, knee deep in water,arranging to meet our new best friends for dinner in the night market – would we , wouldn’t we, a chance meeting and a loose arrangement ..normal amongst travellers in different lands. 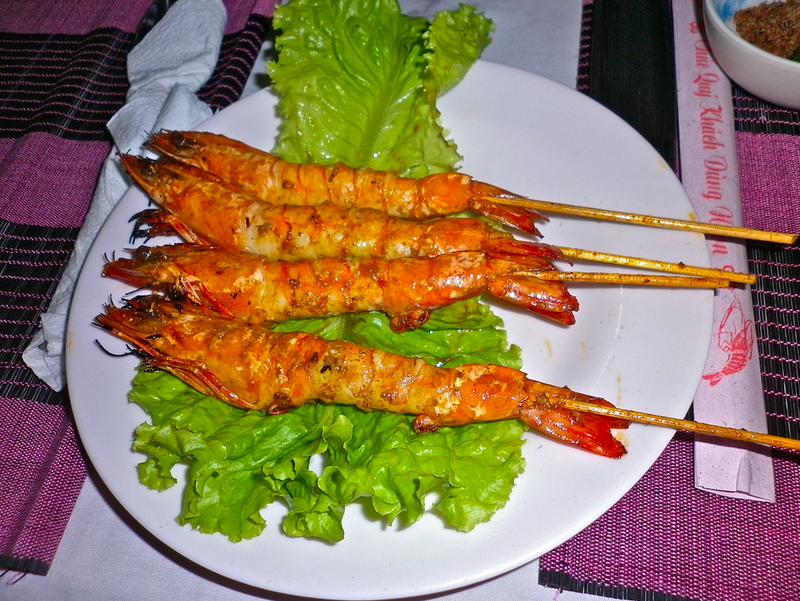 Eating on the beach, not so many beachside eateries to come across, luckily finding one and ordering tamarind prawns, Vietnamese style, I can still recall the taste to this day, superb cooking which in my world would be the subject of a TV show. 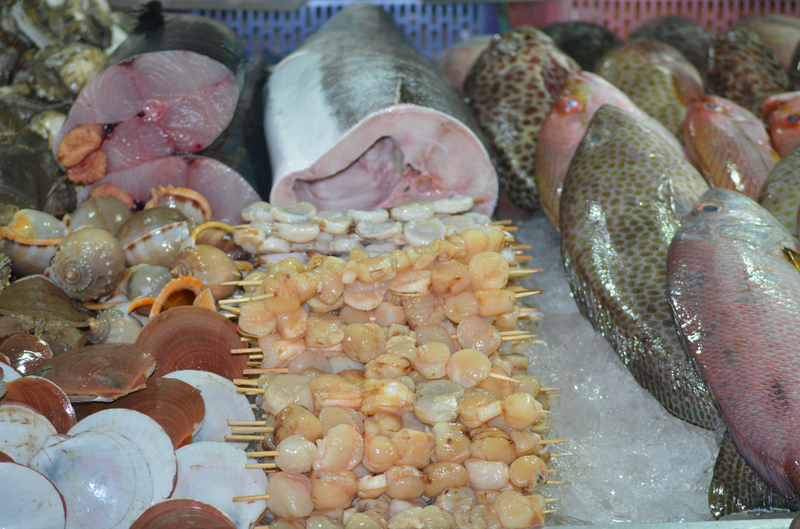 Prawns,scallops, fish all on offer, freshly cooked and utterly delicious. Watching girls grind chilli for local island paste, being offered a huge Helmet shell for sale …carrying my $10 huge shell on the back of the bike, bumping along 30 km of forest track, there was a long cause for regret at my instant purchase. Dropping into a road-side bar/restaurant, finding in situ the very British owner, with his local wife and 2 children scratching a living before tourism hits, meeting an expat Australian over a whisky or two and leaving with an invitation to visit the pearl fishery he was managing.Visiting and learning some new facts about how the whole industry starts in these farms, fascinating manipulation of the natural ecological cycle of the oyster, I still have the beautiful shell he gave me. 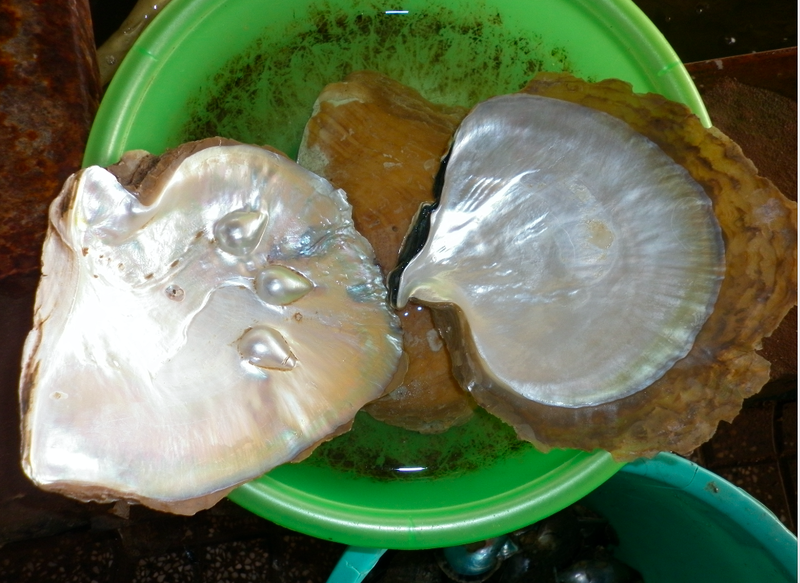 Iridescent oyster shell in a grubby bowl ….. 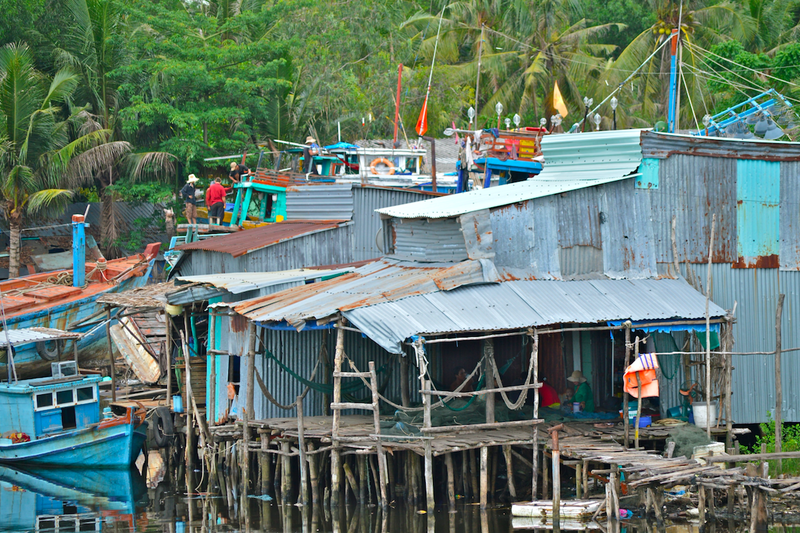 Passing through a village where the track was churned into knee-deep mud after a recent momentary downpour, fisherfolk selling wares in the mud, shacks so basic and tumbledown that it was a shock to realise these were home. Filth everywhere and plastic waste, the scourge of under-developed worlds, scattered as far as you could see. Feeling over-privileged and vulnerable, the bike was moved up a gear or two to power us out of that place . It was an uncomfortable feeling, the only time on the island that the poverty was over-whelming and unwelcoming. The sunsets were my first experience of the South east Asian sunset, intense pink hues flooding the horizon as the setting sun moved west. 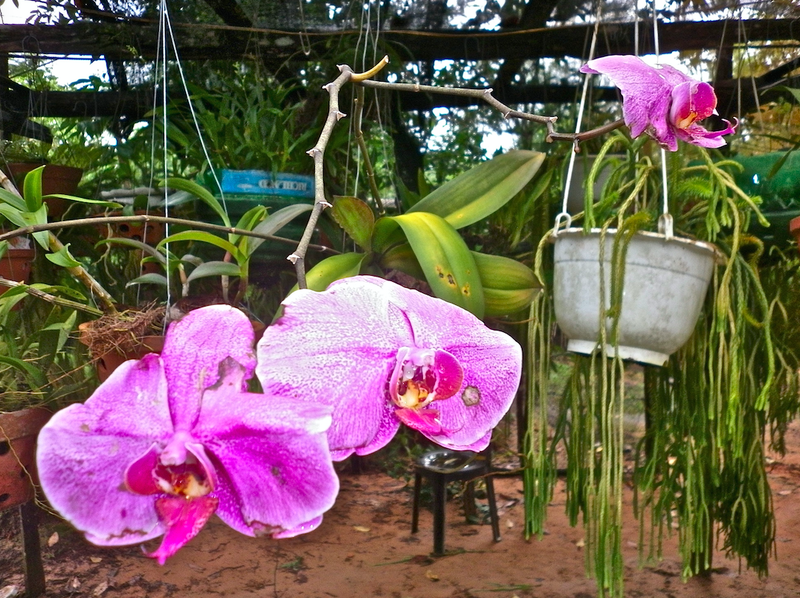 Phu Quoc was a remarkable place to visit,though I suspect that I won’t return, there is too much more of Asia to see and do and in a few years it will be a very different place.